From the sprung, boing! 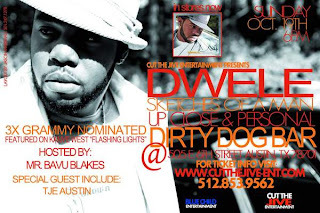 department... Dwele and Tje Austin @ Dirty Dog Bar on Oct. 19th hosted by Bavu Blakes! Dwele (born Andwele Gardner) is an R&B and soul singer, songwriter and record producer from Detroit, Michigan. Dwele grew up in Detroit, listening to such Motown artists as Stevie Wonder and Marvin Gaye and jazz on the radio. Dwele began honing his songwriting skills at the age of ten, after his father's murder outside his home. He also attended Detroit's Cody High School. After briefly attending Wayne State, he left college to pursue a more informal education while working for the American Automobile Association. His demo tape, The Rize, generated interest, and he subsequently began collaborating with hip hop group Slum Village and Bahamadia. Dwele's debut album Subject was released in 2003 through Virgin Records, and his second album Some Kinda... followed in October 2005. Dwele was recently nominated for a Grammy, as was uncovered by Jada Thompson in an interview for FLASH magazine. Dwele has recently left Virgin Records and has signed a new recording contract with Koch Records. His first release under his newly adopted family will be his third studio album entitled 'Sketches of A Man'. The first single off of this project 'I'm Cheatin', is currently making the rounds on radio and the web.